Why try PestXpert? PestXpert allows you to see where you have sprayed. High-Pressure pinpoint spraying allows you to spray up to 5 feet away. The foam expands to easily fill cracks and crevices. Great for difficult to reach areas and uneven surfaces. Pest Xpert will also keep killing for up to four months. DoMyOwn.com. PestXpert Foaming Insect Killer is a first-of-its-kind foaming aerosol barrier spray. This product has a foaming characteristic that allows you to see where you have sprayed and will disappear within a few minutes to create an invisible home barrier. Do My Own Pest Control is the exclusive distributor for PestXpert! A new line of prosumer pest control products. PestXpert Foaming Insect killer is a foaming aerosol barrier spray labeled for both outdoor and indoor use. The foam penetrates deep into cracks and crevices. Users can actually see that the foam went where it was targeted. It has a five or more feet range for high pressure pinpoint spraying. This allows you to spray hard to reach areas such as under soffits, along gutters, in weep holes, above and along window sills. Combine PestXpert Foaming Insect killer with traditional “3-foot up and 3-foot out” home barrier sprays. Some barrier sprays might miss entry points. The foaming spray will provide additional protection from invading insects. The high pinpoint spray works great for indoors as well. It allows for you to hit hard to reach spaces like piping/ductwork, basements, crawl spaces, attics, inside cabinets, and baseboards. It’s microencapsulated, meaning it’s a controlled release of the active ingredient. It will kill on contact and keep killing for up to four months. The water based formula means no staining, odor or mess. Impervious surfaces such as sidewalks, driveways, patios, and porches are limited to spot or crack and crevice treatments only. This also applies to structural surfaces like windows, door and eaves. Exceptions for treatment are treating soil or vegetation , lawns, and turfs around structures. For building foundations, a maximum height of 3 feet can be sprayed but not to the point of run off. And it’s that easy with the expert help from Do My Own Pest Control dot com! Subscribe to our channel for more DIY and product videos! PestXpert Foaming Insect Killer is a first-of-its-kind foaming aerosol barrier spray. This product has a foaming characteristic that allows you to see where you have sprayed and will disappear within a few minutes to create an invisible home barrier. The foam will penetrate deep into cracks and crevices and is perfect for gap and void areas such as along gutters, in weep holes, along window sills, and in vertical seams of vinyl siding. PestXpert Foaming Insect Killer allows for high pressure pinpoint spraying - spray from 5 feet away. It is a great product to use with other home barrier sprays such as those "3 foot up and 3 foot out" sprays and offers more protection around entry points. This aerosol is great for use as a preventative treatment to keep those pesky insects out! The PestXpert Foaming Insect Killer kills a broad range of household insects such as cockroaches, ants, fleas, beetles and crickets. It works great for both indoor and outdoor use, even for difficult-to-reach areas and uneven surfaces. Leaving no mess, odor, or stain, this water-based formula is released through micro-capsules to kill on contact and keeps killing for up to 4 months. Before using PestXpert Foaming Insect Killer outdoor, remove debris and leaf litter from next to the foundation. Make sure to also cut back vegetation and branches, move or rake back rocks, deep mulch or other potential pest harborage next to the foundation. Apply as a coarse spray to thoroughly and uniformly wet the foundation and/or band area. This will allow the insecticide to reach the soil or thatch level where pest may be active. Applying around windows, doors, service line entrances, eaves, soffits, and roof overhangs can greatly reduce the potential for entry by crawling pests. When using outdoors to kill ants, spray around ant trails and hills. Also around nests hidden under steps, brickwork, concrete, etc. Break apart accessible nests and spray on and around debris until surface is slightly wet. Treatment of infested fences and tree holes is permitted. Spray outside surfaces or screen of doors, window frames or wherever insects may enter the home. Around light fixtures, on porches, in garages and other places where insects land or congregate is permitted. For barrier treatments, apply at the rate of 4 seconds of spraying per 3 linear feet. Pests may also be sprayed directly with an application of spray for 2 second. For overwintering pests, treat in late summer or fall just before pests begin looking for winter shelter. Spray siding, eaves, around windows, doors, utilities and window screens. To help reduce infestations, treat cracks and crevices, attics and other indoor winter hiding places. Spray outside surfaces around pet house, kennel, or sleeping quarters for flea and tick control. Do not apply directly to swimming pools or swimming pool systems. Apply as a spot or crack-and-crevice treatment to impermeable surfaces such as tiles walkways around pools. Do not apply to boat surfaces that contact water. Spot treatments may be made to exterior surfaces that do not contact water. Broadcast applications to exterior surfaces of boats are prohibited. Use on the inside of boats is okay. Do not reapply for 21 days. Also make sure product won’t drain or wash off into water bodies or other aquatic habitats. Before applying to vinyl or aluminum siding, treat a small area and evaluate 30 minutes later to allow any potential staining to occur. Regardless of the test results, do not apply to vinyl or aluminum siding when exposed to direct sunlight or during the heat of the day. Staining, bleaching, or discoloration may result to extreme heat or direct sunlight. And it’s that easy with the expert help from Do My Own Pest Control dot com. Make sure to subscribe to our channel for more instructional and product videos. To kill Ants (excluding Fire Ants, Pharaoh Ants and Harvester Ants): Spray around ant trails and hills. Spray around nests hidden under steps, brickwork, and concrete areas. Break apart accessible nests and spray on and around debris until surface is slightly wet. Treatment of infested fences and tree holes is permitted. To kill Cockroaches, Carpenter Ants, Spiders (excluding Black Widow and Brown Recluse), Crickets, Firebrats, Silverfish (and other listed crawling insects): Spray outside surfaces or screens, doors, window frames or wherever insects may enter the home. Also spray surfaces around light fixtures, on porches, in garages and other places where insects land or congregate. For barrier treatments, apply at the rate of 4 seconds of spraying per 3 linear feet. Pests may also be sprayed directly with an application of spray for 1 second. To kill Asian Lady Beetles, Box elder Bugs, Stink Bugs: Treat in late summer or fall just before pests begin looking for winter shelter. Spray siding, eaves, around windows, doors, utilities and window screens. To help reduce infestations, treat cracks and crevices, attics and other indoor winter hiding places. To kill Fleas and Ticks, including those that may carry/transmit Lyme disease: Spray outside surfaces around pet house, kennel or sleeping quarters. Spray fleas and ticks directly with a 1-second application. For barrier treatments, apply at the rate of 4 seconds of spraying per 3 linear feet. Applications Around Swimming Pools: Do not apply directly to swimming pools or swimming pool systems. Apply as a spot or crack-and-crevice treatment to impermeable surfaces such as tiled walkways around pools. Applications in and on boats: Do not apply to boat surfaces that contact water. Broadcast applications to exterior surfaces of boats are prohibited. Spot treatments may be made to exterior surfaces that do not contact water. Use inside boats, ships and vessels is permitted. Do not reapply for 21 days. Do not allow product to drain or wash off into water bodies or other aquatic habitats. Vinyl and Aluminum Siding: Applications made to vinyl and aluminum siding (particularly lightly colored, aged, weathered or otherwise damaged) may result in staining, bleaching or discoloration. Factors such as extreme heat or direct sunlight can promote damage when using this product. Before applying this product to vinyl or aluminum siding, treat a small area and evaluate 30 minutes later to allow any potential staining to occur. Regardless of the test results, do not apply to vinyl or aluminum siding when exposed to direct sunlight or during the heat of the day. 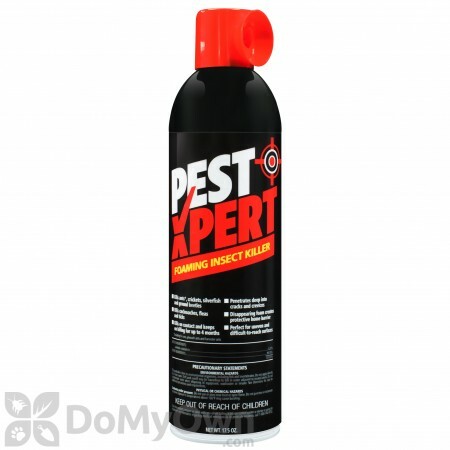 PestXpert Foaming Insect Killer is labeled for indoor use. It’s labeled for some ants, beetles, cockroaches, carpenter ants, crickets, some spiders, and silverfish. To use indoors, spray directly into cracks and crevices, in walls, dark corners of rooms, cabinets and closets, along and behind baseboards. Also, make sure to spray beneath and behind sinks, stoves, refrigerators, cabinets, around plumbing and other utility installations, and wherever else these pests may find entrance. 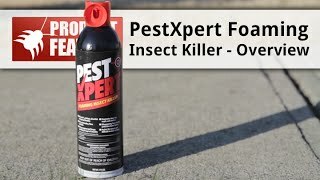 PestXpert Foaming Insect Killer also kills on contact. Apply to visible pests with a 1-second spray. For overwintering pests like Asian Lady Beetles, Boxelder Bugs, and Stink Bugs: Spray around doors, window frames or wherever insects may enter the home. Also spray surfaces around light fixtures, on porches, in garages and other places where insects land or congregate. Spray infested areas around pet beds and resting quarters for control of fleas and ticks. Also treat nearby cracks and crevices, along and behind baseboards, window and door frames and localized areas of floor coverings where these pests may be present. Test inconspicuous sample of fabric or rug for staining before use. Old bedding of pets should be removed and cleaned or replaced with clean, fresh bedding after treatment of pet area. To control the source of flea infestations, treat your pet with a product registered for animal application. And it’s that easy with the expert help from Do My Own Pest Control dot com. Make sure to subscribe to our channel for more instructional and product videos. To kill Ants (excluding Fire Ants, Pharaoh Ants and Harvester Ants), Beetles, Cockroaches, Carpenter Ants, Crickets, Firebrats, Spiders (excluding Black Widow and Brown Recluse), Silverfish (and other listed crawling insects): Spray directly into cracks and crevices, apply to visible pests with a 1-second spray, in walls, dark corners of rooms, cabinets and closets, along and behind baseboards, beneath and behind sinks, stoves, refrigerators and cabinets, around plumbing and other utility installations, around waste container and wherever else these pests may find entrance. To kill Asian Lady Beetles, Boxelder Bugs, Stink Bugs: Spray around doors, window frames or wherever insects may enter the home. Also spray surfaces around light fixtures, on porches, in garages and other places where insects land or congregate. To kill Fleas and Ticks, including those that may carry/transmit Lyme disease: Spray infested areas around pet beds and resting quarters, nearby cracks and crevices, along and behind baseboards, window and door frames and localized areas of floor coverings where these pests may be present. Apply directly to pests with a 1-second spray. Test inconspicuous sample of fabric or rug for staining before use. Old bedding of pets should be removed and cleaned or replaced with clean, fresh bedding after treatment of pet area. Do not treat pets with this product. To control the source of flea infestations, treat your pet with a product registered for animal application. Product was VERY easy to use, and gets into tight spots around plumbing and other areas that are unreachable. I would recommend this to homeowners in addition to their maintenance routine to get those extra hard to reach areas. It also does kill on contact as well. I rarely write a review, but this product warrants it! Easy to use and apply and it does the job well! A real waste of time and money. As a professional pest controller I would never recommend this product. Is true is very easy to use and reaches cracks and crevices very good, but does nothing with American roaches. Not good at all. I used two cans to treat my home last summer. Worked great. No ants, asian beetles, or stink bugs made it inside. I will be using again in the spring. I cannot use this in our restaurant. However it works well. In all storage areas. Is PestXpert Foaming Insect Killer safe for pets.? What insects will it kill? PestXpert Foaming Insect Killer is safe for pets when treated areas are completely dry. It is labeled for many insects including roaches, ants, beetles, spiders, ticks, etc.Please refer to the product label for the complete list of pests. Is PestXpert Foaming Insect Killer safe for pets after it is dry? Yes, once the surfaces treated with PestXpert Foaming Insect Killer are dry, it is safe for your pets to return. Is PestXpert Foaming Insect Killer harmful to pets? PestXpert Foaming Insect Killer is safe around pets when used as directed and should not harm them. Pets and people should be out of the treated area during treatment until dry. How much area does one can of PestXpert Foaming Insect Killer cover, and can rain wash it away? PestXpert Foaming Insect Killer covers 2000 square feet. This product should be applied in cracks and crevices where it has time to dry before any precipitation. Is there a similar product to PestXpert Foaming Insect Killer with a straw attachment? We do have Cy Kick CS Aerosol. It does have a foaming agent in it and can be used in the same way the PestXpert is. They do have different active ingredients in them as well.